Here's a high quality top-selling original Bic® promotional pen series that can deliver the very best when it comes to built quality, construction and high documental ink that lasts long and out-performs other stationery pens by far. Customised with your company brand name printed on the barrel of the pen, you can customise your colour too: Satin chrome, blue or black - for a beautiful finish that will look just fine in your customers shirt, desk or personal stationery collection. 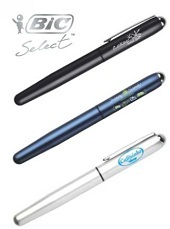 Why not hand these Bic® Steel Roller Pens with Logo Branding as a luxury business gift to customers and make a dazzling impression with a touch of style? For a FREE QUOTE, please fill in the form regarding our Steel Roller Pens with Logo Branding and we'll be able to help you.